It’s theatre, it’s film, it’s theme park fun! Theme Park Theater? What does that mean? This question has been running through my head since my invitation to attend The Eagle Theatre’s World-Premiere Production of NOIR: The 3D/4D Semi-Cinematic Satirical Thriller. I am no stranger to The Eagle Theatre’s productions. I continue to be riveted by their technical elements one production after another and this was no different. Except… this one left me grappling for words. Even as I write this, I am having trouble truly grasping my thoughts to explain to you what I witnessed. The noir genre as we know it are crime-based films particularly of the 1940s and 50s that featured a mix of femme-fatales, crime fighting detectives, and shot in black and white. Think Alfred Hitchcock, although some question is Psycho fits the bill. From-the-rip, I knew there would be film involved as The Eagle Theatre’s Innovative Factory successfully used projections in their last musical, The Last 5 Years. What I didn’t know, is that the characters IN the film would all be played by one person. The very person who is also the solo star of the live production before us, Tim Rinehart. This was perfect for someone like me who is NOT a fan of any films in B&W, particularly of that time. Rinehart reminds me of Patrick Warburton from TV’s “Rules of Engagement.” Debonair yet over the top and controlled. The stage, as designed by Innovations Factory, was set in an office, all adorned in grays and whites to emulate the B&W film. In the middle was a full-on film screen that extended the office upstage with true depth perception of space as designed by Chris Miller’s 3D concept and Don Swenson’s FX knowledge. The theatre house was also part of the design by integrating the windows of the theatre to match the windows of the set as well as a ceiling fan hanging above the first few rows. Although the audience wasn’t interacted with during the play by Rinehart, we were very much a part of the action with the 4D elements. 4D! This is exactly what you expect at a theme park like Universal. They really did go for it with this introductory piece by using wind, water, bubbles, scents, vibrations, sound, and so much more. It employed all my senses to the point where I was so in tune with them that I wasn’t even sure if I was truly feeling all these things or if my mind was playing tricks? Did I just smell burnt rubber? Did I just feel my chair vibrate? Director Ted Wioncek III and Rinehart both wrote NOIR in tandem. Rinehart provided much material for the stage play while Wioncek focused on the screen play. Both working hand in hand and interwoven with each other. Rinehart as the center of the story walked in and out of the film with precision and at times interacted with live action with the characters on screen with lighting cigarettes and passing money. It was a sight to see! The film was completely satire. Each character as portrayed by Rinehart didn’t take itself seriously but had full believability. A full-fledged who-dun-it mystery. I wouldn’t call the play a thriller, but I would call it theatrically thrilling, innovative, and down right funny. What is often ignored at theatres is sound design. David Pierron has no small fete. Intergrating an original score (Jason Neri, Ryan Cullen, Tim Aucello, Len DeFrank, Josh Dowiak) with on stage acting and effects as well as in film sound and effects. Mesmerizing was the sound balance between the two worlds. The noir style was in full effect when characters were on film but when Rinehart went in and out of the film, his sound migrated too. Was is cue to cue, what it stage-to- film? As a theatre lover, I was just in awe of how stage management (Rick Trovato) was pulling it all off. This piece of “theme park theater” is a see for yourself event! Bring a coat cause the theatre gets quite chilly at times or grab a glass of wine to stay warm from their Sharrott Winery Bar before the show as this runs 100 minutes or so without an intermission. As I mentioned, it’s truly hard to put into words this theatrical event. I left wanting more. I wondered how this style would work with already scripted plays and musicals. I was tickled to be in an audience that was having fun on this theatrical ride with me. There is no height requirement to ride the ride, so step right up and get your tickets and be on the ground level of what is bound to become a growing art form at The Eagle Theatre. 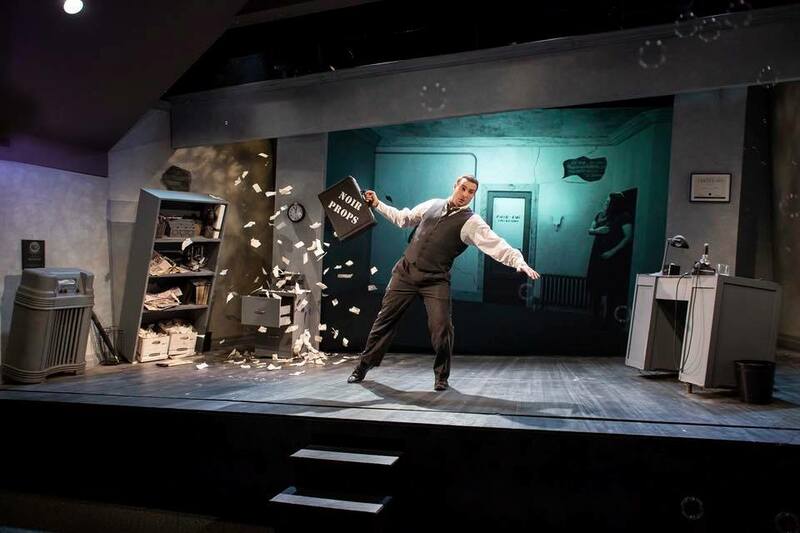 NOIR runs through October 14th at The Eagle Theatre in Hammonton, NJ. Review cross posted with permission from Broadway World Philadelphia.